Considering EA’s recent trend of reviving old IPs in a freemium world, it’s safe to say that expectations weren’t high when it was announced that SimCity would return to iOS with a free-to-play model. Yet, SimCity BuildIt (Free) is surprisingly tolerable with impressible visuals and a somewhat fair monetization system. Sure, it’s not the SimCity game that most fans of the series probably want but I think it manages to do the franchise some small justice. For folks thinking that BuildIt is the second coming of classic SimCity gameplay, you’re going to be disappointed. At its core, BuildIt is a standard crafting freemium title with timers. Basic factories create building block materials that are used as the foundation to building more advanced items, all of which are used to upgrade residences. Residences award money, population and experience. Money is used to build and upgrade factories, stores and public facilities. Population and experience go towards separate systems for unlocking new buildings to construct. Later levels allow players to apply those crafting materials to other objectives, such as satisfying shipping orders to obtain special keys that can be used to construct specialty buildings. 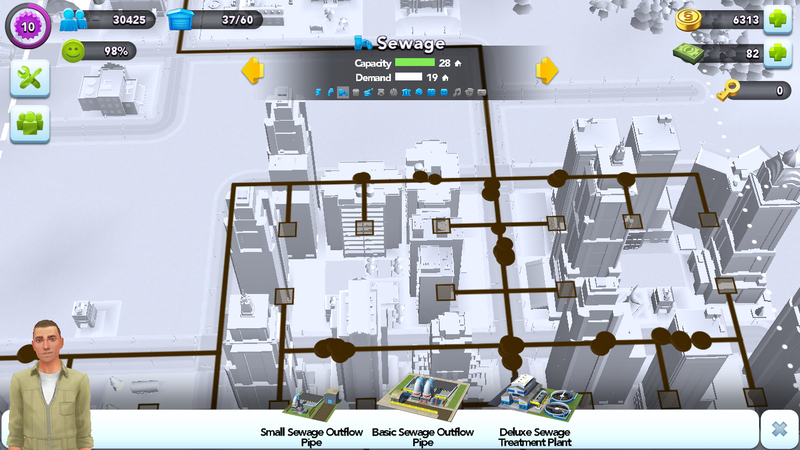 While BuildIt’s gameplay obviously centers around the crafting mechanic, there are lots of nods to classic SimCity fare that make appearances. Fire and police coverage become essentials the further you advance, while placement of those departments become an exercise in strategic zoning to try and get the most bang out of your buck for each building placed. I really enjoy the fact that there are actual (albeit simple) strategic decisions you can make regarding building placement. The same goes for parks, cultural landmarks, and specialty buildings such as transportation and education departments. Power, water and sewage also become important facets as keeping them up to date allow you to build more residences and expand your city. Sure, in the great scheme of things all of the above essentially amounts to coin sinks, but BuildIt does a great job of hiding the obviousness behind the SimCity sheen. Speaking of coin sinks, the biggest question I’m sure folks will have is how fair the game’s freemium elements work. For the most part, I’ll say that they are pretty fair for the type of game it is. Timers are pretty reasonable and there aren’t any hard pay walls that I can see. Coin shortage is a constant problem but BuildIt throws a few avenues your way towards earning more, such as selling crafting materials to the AI (not worth it), selling materials to other players (pretty cool) and, of course, saving them to upgrade residences and earning coins that way. The random nature of acquiring special items for inventory and land expansion is a bit frustrating but again, you can always purchase them from other players if the RNG doesn’t treat you well. My biggest complaint has to do with the game’s decision to limit some of the cooler buildings to premium currency buys (and at amounts that you’ll never earn in-game). Meanwhile, BuildIt’s strongest facet is its graphics. Simply put, I absolutely love the visuals in SimCity BuildIt. Players have full rotational control of their town and all the structures are highly detailed and simply look great. Your city is also teeming with life — zoom in and you’ll see cars on the street, stoplights, and even traffic jams when that becomes a problem for your city. In fact, BuildIt is probably the first timer-based freemium game I’ve played where I actually just want to watch my city while waiting for timers to go by. Sure, a lot of the visuals are superficial in nature, but it’s still a welcome sight and means a lot towards keeping me engage in the game rather than simply setting timers and quitting the app. There are a lot of folks that aren’t going to be happy with SimCity BuildIt purely because it’s not a classic SimCity title. However, I’d caution against taking such a hard stance and enjoying BuildIt for what it is. It’s a freemium title sure, but it’s a relatively fair freemium game in terms of free-to-play barriers. 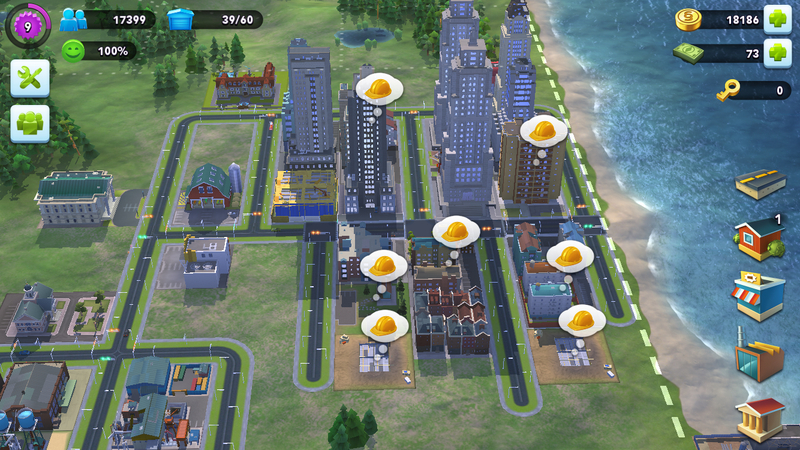 It’s also a visually appealing title that pays homage to SimCity in a variety of ways. Most importantly, even though it’s obviously not a traditional SimCity title, it feels like it even through its free-to-play gameplay, and that’s worth something. If you’re in the mood for a crafting freemium title, you can do a lot worse than checking out BuildIt.